KNOXVILLE – The Knoxville Choral Society is holding fall auditions for the 2018-2019 season on Tue., Aug 14 and Thur., Aug 16, 2018, beginning at 5:30 PM. Auditions will be held at Ebenezer United Methodist Church, 1001 Ebenezer Rd. in Knoxville. Openings are available in all voice parts of the 120-voice volunteer choir. 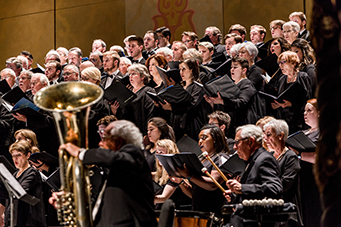 During the 2017-2018 concert season, the Knoxville Choral Society presented a choral masterworks concert under the direction of former artistic director Dr. Eric Thorson. Additionally, the KCS performed Carmina Burana in collaboration with the Knoxville Symphony Orchestra and Aida with the Knoxville Opera. Additional information about the 2018-2019 concert season is available at knoxvillechoralsociety.org. Rehearsals take place most Monday evenings, August-May from 7:30 to 9:30 PM. Auditions will include an assessment of vocal quality, sight-reading, and tonal memory drills. No prepared piece is required for the audition. For more information and to reserve an audition time, please visit knoxvillechoralsociety.org, email membership@knoxvillechoralsociety.org or call 865-312-2440.